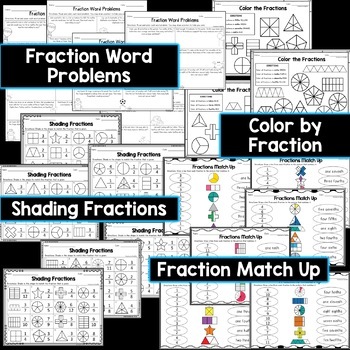 This is a collection of 50 fractions worksheets!. There is a giant variety and each set is differentiated! See description of each set below & check out the preview! This is part of my larger fraction bundle available HERE! 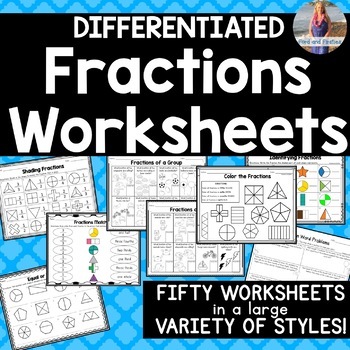 ►Worksheets include: identifying fractions, equal/unequal, shading fractions, fraction match up, fractions of a group, fraction word problems, color the fraction, and more identifying/coloring fractions. ---Ex: What fraction of the balls are soccer balls? ---Ex: Color 1/3 of the butterflies blue. ---Ex: Color all shapes divided into fourths PURPLE. ⭐This product is part of my Fractions Bundle: CLICK HERE!! 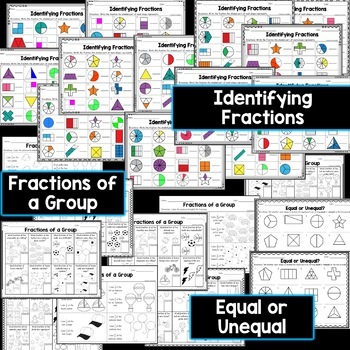 Need more fractions activities? Check these out!! Write the Room: Identifying Fractions!